Spring has landed? In February? No not really landed, but it has been uploaded! It is off to the printer. I’m very excited about this issue and I hope you will be too! Are you marching to the beat of the blues? It’s time to change your tune! 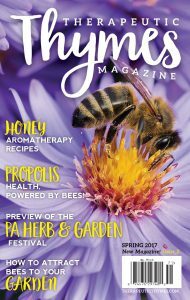 Propolis – Health, Powered by Bees! You can pick up your copy next month at one of Distribution Outlets or you can subscribe today!